From left, House Minority Leader Nancy Pelosi, Senate Minority Leader Mitch McConnell, Senate Majority Leader Harry Reid and House Speaker John Boehner during a 50th anniversary of the Civil Rights Act of 1964 ceremony Tuesday in the Capitol Rotunda in Washington, D.C.
Dysfunction is to Washington as accents are to the Northeast: wide and deep. A lot of research has shown Democrats and Republicans are further apart than ever. Democrats are to the left, Republicans are to the right, and there’s a wide space between the two. But that isn’t the whole story. Take the 2013 government shutdown. A team of Democrats and Republicans in the Senate had no problem passing a bill to avoid the shutdown before the Oct. 1 deadline. House Republicans had no problem passing their own bill. Both bodies were productive, independently and in opposite directions. The shutdown was indicative of a second polarization, largely caused by the first: Ideologically, the House and Senate are more divided than at any time since the end of World War I. You can measure this statistically using the Common Space DW-nominate scores, a system which rates members of Congress on a scale from -1 (most liberal) to +1 (most conservative) based on their roll call votes. I’m using the Common Space scores, which rate senators and representatives on one scale, so we can compare public officials across the House and Senate. This is done using bridge legislators (i.e. those who served in both bodies). We can also compare across time thanks to legislators who served in multiple Congresses. Here are the scores for the median legislator in each body over time, and the differences between the two medians. The House and Senate’s ideologies move mostly in unison. Gaps are usually small and appear during periods of split control, as we have now. 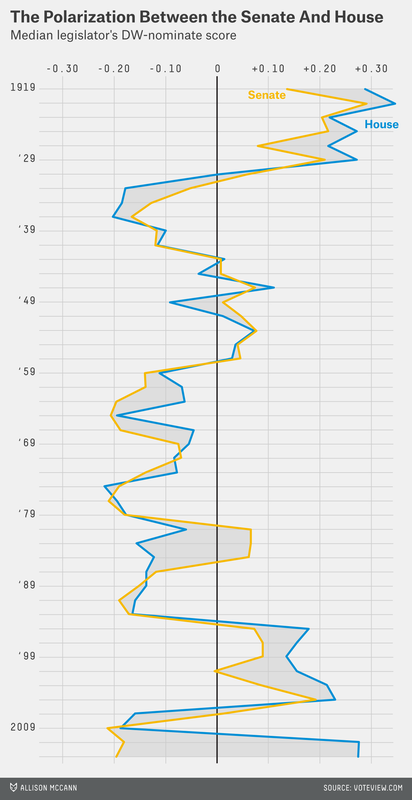 For example, there was a modest gap in the early and middle 1980s, when Democrats held the House and Republicans the Senate. But the past few years have been very different. The gap between the House and Senate is huge. The difference in score is 0.47 for 2013. The next widest is 0.46 for the 2011-12 Congress. There’s no other score above 0.4 in our data set. During the aforementioned early and middle 1980s, the space between House and Senate scores was, at most, a little more than 0.2 points. What is causing this yawning split between the House and Senate? For one, this is only the seventh time since World War I where one party controlled the House and another the Senate. But that’s not all of it. Although there is definitely some disagreement, the prevailing view is that Republicans have moved further to the right than Democrats have moved to the left. This is seen best when comparing within bodies, though we also see it when comparing between bodies. The median House member in 2013, according to DW-Nominate’s joint scaling scores, is slightly less conservative than she was in the last Congress. The median senator, meanwhile, is slightly more liberal than she was last Congress, though slightly less liberal than the Congress before that. When we contrast the two bodies, we see that the House is slightly more conservative at 0.27 than the Senate is liberal at -0.20. That fits with the idea that polarization is “asymmetric,” with House Republicans more responsible than Senate Democrats, but it’s clear that the median member of both chambers is closer to the poles than they usually are. The median House member in the current Congress is the fourth-most conservative out of 49 Congresses since the end of World War I. The median senator is tied for the fourth-most liberal. Basically — and this will shock no one — Congress is a mess: The two parties are acres apart, and the two branches are the furthest apart they’ve been in our lifetime (though that may change come November).